Of the top 100 sites on the Web, which ones grew the fastest in 2008? In a report it is preparing to release tomorrow, The comScore 2008 Digital Year In Review (which you can sign up for here), comScore ranks the 20 fastest-growing Web properties. These are out of the largest 100 sites overall. They are shown in the chart above, as measured by growth in unique visitors. (Interestingly, in a separate list of the ten largest sites, only eBay showed a decline from 2007). Most of the big gains among the fastest growers came because acquisitions (CBS acquiring Cnet, Everyday Health acquiring Revolution Health, JPMorgan Chase acquiring Washington Mutual) or traffic and business partnerships (Break Media, Glam Media, and Everyday Health with Drugstore.com). [Correction: Because of a mistake in our draft copy of comScore’s report, we originally characterized Drugstore.com as having been acquired by Everyday Health. Drugstore.com is simply part of Everyday Health’s ad network, and thus counts towards its total audience size, but is a separate entity]. If you strip out all of those, which denoted by asterisks, you get the sites that grew organically, including Infospace, WordPress, Weatherbug, Answers.com Sites, Facebook, Hearst Digital Media, and Mozilla. During 2008, comScore estimates that 4.5 trillion display ads were served in the U.S. alone. That comes out to more than 2,000 Internet ads per month per person. And, believe it or not, the number of ads served up actually declined a little during the year as publishers tried to push up CPMs (the amount they can charge per thousand ad impressions) by reducing inventory. Above are the top ten publishers of display advertising as of November, 2008, along with how many billions of ad impressions each one served up in that month. 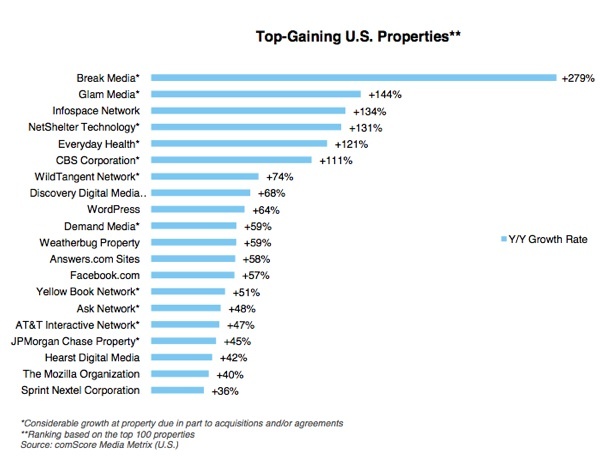 Only two of the fastest-growing sites also made the list of top ten publishers of display advertising: Facebook (No. 4) and Glam Media (No. 9). Now if we could only get the average CPM per site, then we could create a more interesting ranking of the sites that make the most money from their ads.